ACTION: Its micro particles make it a unique product in daily hygiene, exerting a stimulation of the skin layers. Cleansing product composed by putting fine biodegradable particles that thanks to their form and size eliminate the skin impurities without scratching. MAIN INGREDIENTS: Skin cleansers not formed by surfactants. Biodegradable granules of natural origin that do not attack the skin and are respectful with the environment. INDICACTIONS: Suitable compound to drag superficially the impurities of the skin and to remove the makeup. For a deep hygiene in any type of skin. For more affected skins or those who present marks as acne. SKIN CARE ROUTINE: It is recommended to clean the skin at least once a day. Apply on face neck and neckline, massaging in ascending circles until partial absorption of the emulsion. Remove the product with gauze or cotton slightly moistened with the Balancing Face Toner. If there are exfoliating particles on the skin (Scrub), remove with dry cotton swab or clean brush. OUR ADVICE: Since it’s not an abrasive product, it can and must be used in any type of skin and daily. Its composition facilitates the skin oxygenation by removal of dead skin cells, favoring the absorption of the next product to be applied. MAIN INGREDIENTS: ALOE VERA: Its soothing and regenerating action provides freshness to the skin as well as moisturizing it, making it perfect for dry, irritated, or reddish skin. NMF: Natural Moisturizing Factor, rich in amino acids with great capacity of penetration allowing the hydration of the deepest skin layers. INDICATIONS: Moisturizes and refreshes the skins calming them against external aggressions. SKIN CARE ROUTINE: Apply in the mornings and nights after Emulsión Higienizante (Cleansing Milk) and before the treatment product, (Elite, Nutriestimul, etc...). OUR ADVICE: If you live in a zone where the water is too chlorinated or too alkaline, use ONLY Balancing Face Toner on the face skin neck and neckline. Balancing Face Toner will soothe any irritation you have suffered. Witch hazel (Hamamelis virginiana): The leaves of this plant are used as they are rich in phenols and tannins and have astringent, decongestant and healing properties. Alphahydroxy acids (AHA): lactic acid, glycolic acid, citric acid and tartaric acid; This cocktail of acids does not act in the most superficial corneum stratum as other AHAS, but in deeper layers of the horny layer, refining it and improving the flexibility of it independently of its grade of hydration. Blueberry: Its leaves contain flavonoids and phenolic acids as well as triterpenes. Its use in cosmetics is due to its great content in anthocyanins that protects and reinforces the walls of blood vessels. It also has an important anti-radical function. Onion extract: Extracto de Cebolla: application in medicine since the early civilizations. With antioxidant properties since it is involved in enzymatic activities and metabolism of collagens and phospholipids. Ascorbic acid or Vitamin C: Powerful antioxidant. Ascorbyl phosphate sodium (provitamin which is activated on contact with the skin). Sage extract: Antiseptic, anti-inflammatory and fungicide. Lactic acid: Proceeding from the milk, it favors a light exfoliation, hydrating simultaneously the skin. Nicotinamide: is part of the group B vitamins and its deficiency causes hyperpigmentation and hyperkeratinization. It is used in acne treatments and in cases of hyperkeratinization and sunspots on the skin. It is a great antioxidant and detoxifier. INSTRUCTIONS: Especially recommended in mixed and greasy skins and with excess of keratinization and thickened stratum corneum. Also recommended on skins with acne tendency. The soft peeling action that it produces favors a better absorption of the next cosmetic used optimizing its results. SKIN CARE ROUTINE: Moisturize generously a gauze or cotton disk with Kerathor 50 PLUS and extend dragging along the face, neck and neckline. Apply at night and leave on between 5 or 10 minutes before you continue with the cosmetic ritual, serum and cream recommended by a specialist in aesthetics. OUR ADVICE:To achieve maximum results always apply it on the skin previously well removed and then after Kerathor 50 PLUS use some of the ISSÉIMI products specific to your skin type and result you wish to get. ACTION: Regulates the natural skin mechanisms, prevents aging and hydrates in deep. Tissue regenerator. MAIN INGREDIENTS: EGF: The Epidermal Growth Factor interlocks with its receptor to cause a response of skin cells that consists on the proliferation of keratinocytes and fibroblasts, an increment in collagen synthesis and the activation of the anti-stress system and SOD action (anti-oxidative and anti-ageing effect). It is, therefore, the most important regenerating and anti-ageing product of its line. Multi-moisturizing Factor: A compound formed by several ingredients, including urea, lactic acid or free amino acids that maintain the optimum level of Natural Moisturizing Factor. By Natural Moisturizing Factor we refer to the water trapped between cells (intercellular), which provide flexibility and uniformity to the stratum corneum in order to maintain it constantly nourished. The moisturizing factor must be used for dehydrated or aged skin... due to its capacity to provide and maintain the skin´s optimum moisturizing level. Aloe Vera: Emolient action, moisturizing,amtiseptic, anti-inflammatorie and astringent. Alantoin: Soothing additive and skin healing. It has proved to hold regenerative properties, healing, softening, soothing and keratolytic. E Vitamin: Provided from wheat germ. With antioxidant power meets a double function: allow the addition of a lower amount of preservatives and act as an adyuvant at preventing aging effect. INSTRUCTIONS:In dehydrated skins with minimum wrinkles. Its usage after treatment HEBER FARMA improves the result. SKIN CARE ROUTINE: In the morning before make. At night after skin hygiene with Emulsión Higienizante and Tónico facial Equilibrante. It is recommended its application together with Fluido viscoso Forte EGF. ACTION:Fill effect, favoring the production of substances of the dermis such as collagen. Ensure appropriate levels for skin hydration. Stimulate the peripheral circulation, revitalize the cell cycle. INSTRUCTIONS FOR USE: Ask about application protocols. Product for professional use. Apply with KGF Gel Acondicionador ​by means of microcurrents. NOTE: The recommended dose of product is for face, neck and décolleté. If you apply partially must consider also the corresponding proportion. ACTION: Deeply regenerating and moisturising product which restores from the deepest skin layers. USES: Improves blood circulation. Regenerating effect. Anti-ageing. Ultra-moisturising effect. Couperose skin, hair weakness, advanced ageing processes. INSTRUCTIONS: Check application procedures. Product for professional use. 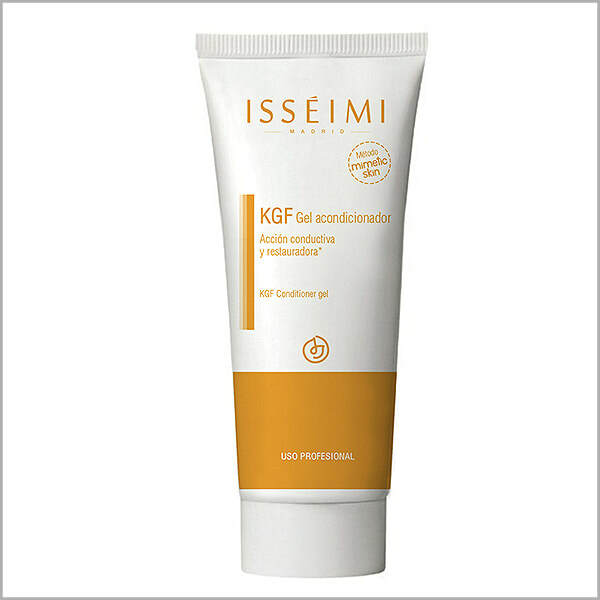 Apply in combination with KGF Gel Acondicionador by means of microcurrents. NOTE: The amount of product recommended corresponds to face, neck and cleavage. Use proportionally for partial applications. ACTION: Firming up treatment. Maintains tissue elasticity. Has the capacity to regenerate elastine fibre. Reduces the generation of free radicals. Regenerates dermis structure as part of the connective tissue by penetrating into the minor dips in skin. USES: Restraining tissue laxity. Regenerator. Anti free radicals. Facial rejuvenating product. For stretch marks and cellulite. ​NOTE: The amount of product recommended corresponds to face, neck and cleavage. Use proportionally for partial applications. ACTION: Anti-ageing treatment. Adjuvant to dermal regeneration. It determines the increment in the number of keratinocytes and fibroblasts in charge of producing the main substance and the reticular and elastic collagen fibres that form skin. USES: Improves blood circulation. Regenerating effect. Anti-ageing. Ultra-moisturising effect. Couperose skin. ACTION: Anti-oxidative lightening skin treatment that reduces the harmful effects of oxidative processes. ACTION: This gel has conductive and restoring properties thanks to the peptide KGF*, which contributes to the vehiculisation of the selected water-soluble carrier for its perfect distribution on skin to optimise results. MAIN INGREDIENTS: The KGF (Keratinocytes Growth Factor) contributes to epidermal cell renovation and maintains a healthy and totally restored stratum corneum. The KGF is also responsible for the germinative cellular homeostasis, which means a homogeneous and correctly moisturised corneum stratum that aids to the regular elimination of corneocytes without altering cell cycle. It also helps to obtain a more permeable stratum corneum that allows a quicker absorption of the associated ingredient. The efficacy of both products is, therefore, improved. Its high Aloe Vera content makes of this an ideal product to be applied after a peeling, laser and/or IPL treatment due to its moisturising, soothing, refreshing and protective action on the skin. It also contains a wheat seed water-soluble extract that supports the vegetable active ingredient and later on its film-forming effect. This is a mechanism that reorganises its components' electric charges to allow a positive attraction with skin in order to obtain a long-lasting skin tension. USES:It is always to be used associated to some of water-soluble solutions. Low intensity currents can be used on them (when they are ionisation currents, the positive pole should be the one in contact with the product). To be applied after a peeling treatment or when skin needs to recover to a healthy state. INSTRUCTIONS:Mix KGF Gel Acondicionador with the selected water-soluble solution depending on the desired effect. Spread on face, neck and cleavage. Apply massage movements to improve absorption into the skin. When used with radio frequency or other electric currents as a conductive product, it exhibits good synergy thanks to its active principles and optimises results. NOTE:The amount of product recommended corresponds to face, neck and cleavage. Use proportionally for partial applications. ACTION: Removes corneocytes of the skin barrier. Combined with other products produces animportant peeling effect. Glycolic Acid is an alphahydroxy acid which is non-toxic and is not absorbed systemically, so we have the guarantee of employing it always on the skin. It is extracted from fruits, sugar cane and other food. Differs from other AHA (alphahydroxy acids) because it contains only 2 carbon atoms, which makes it have a superficial and deep chemical peeling effect at the same time, causing a progressive exfoliation and thinning of the stratum corneum helping to increase the thickness of the other ​epidermal layers. It works by dissolving the union between keratinocytes helping their gently detachment every day. INSTRUCTIONS FOR USE: Apply on the skin previously cleaned. Leave on for a few minutes and neutralize the partial or total areas that require help. ​RECOMMENDATION: It’s always better to combine the action of a physical peeling with a chemical peeling to maximize the exfoliating effect of both. ACTION: Removes corneocytes from skin barrier. When combined with other products, it exhibits an important peeling effect. This acid comes from bitter almonds, thus its German name “Mandel”, which means almond. Its moisturising and exfoliating properties exhibit scaling actions that do not cause irritation or redness. It is indicated for acne treatment, since it has got exfoliating, germicidal and bactericidal properties. It may also be used for the treatment of ageing skin and dark spots. Thanks to its mild irritating effect, it can be used on couperose skin. Not recommended for summer use. Men skin, which suffers daily shaving aggression, is suitable for this peeling, since it causes no discomfort. INSTRUCTIONS FOR USE: Apply on previously cleansed skin. Leave it on for a few minutes and neutralise the whole or partial areas that require any aid. ACTION: Removes corneocytes of the skin barrier. Combined with other products produces an important peeling effect. INDICATIONS: Indicated in sensitive skins, dehydrated, with dermatitis. It is corrosive to fabrics by prolonged contact. It can cause itching and local irritation, especially in hypersensitive individuals. INSTRUCTIONS FOR USE: Apply on the skin previously cleaned. Leave on for a few minutes and neutralize the partial or total areas that require help. RECOMMENDATION: It’s always better to combine the action of a physical peeling with a chemical peeling to maximize the exfoliating effect of both. ​ACTION: Facilitates the removal of dead keratinocytes from the skin surface. It is a derivative from tartaric acid and is obtained from grape seeds. It causes a progressive exfoliation and thinning of the stratum corneum, helping to increase the thickness of the other epidermal layers. When used at low concentrations, it reduces corneocytes interlocks and makes them come gently off on a daily basis. Repeated regular applications may significantly reduce minor facial wrinkles. INDICATIONS : Recommended for ageing skin and/or skin that needs to gain firmness. It may be initially used for the treatment of ichthyosis and other skin dry conditions. It was later on discovered that these substances were also effective for the treatment of acne, seborrheic keratosis and freckles. ACTION: Inhibits tyrosine’s activity preventing the formation of spots and helps to eliminate them. It helps to reduce dark spots always associated with other active ingredients. INDICATIONS: It is a product mainly used for skin whitening. Although primary used as cosmetic also has other purposes. When used on the skin is reducing melanin production. Kojic acid proves to be effective after 2 or 3 months of treatment. This acid is present in natural ingredients as soy and rice. Removing skin spots is a slow and complex process that unfortunately does not satisfy all expectations as wish. Must be very cautious when ensure results. Avoid sun exposure during treatment. When applied can produce a slight itching sensation on the skin. People with sensitive skin don’t need to use this acid. It’s always better to combine the action of a physical peeling with a chemical peeling to maximize the exfoliating effect of both. ACTION: It makes the stratum corneum permeable in order to increase the oxygenation of dermal strata and promotes a considerable increment in the absorption of active principles. Acts on skin to release corneocytes and the stratum corneum and to make it more permeable. MAIN INGREDIENTS: Resorcinol: it is produced from Resorcin resin. At low concentration levels, it is used for medical purposes to treat itchy skin and other disorders such as eczema and psoriasis. It causes the stratum corneum to flake off and reduces its normal thickness. It is also used as an antiseptic product to treat acne and seborrheic dermatitis. Salicylic acid: provokes the flaking off and reduction of the stratum corneum and facilitates the elimination of corneocytes. 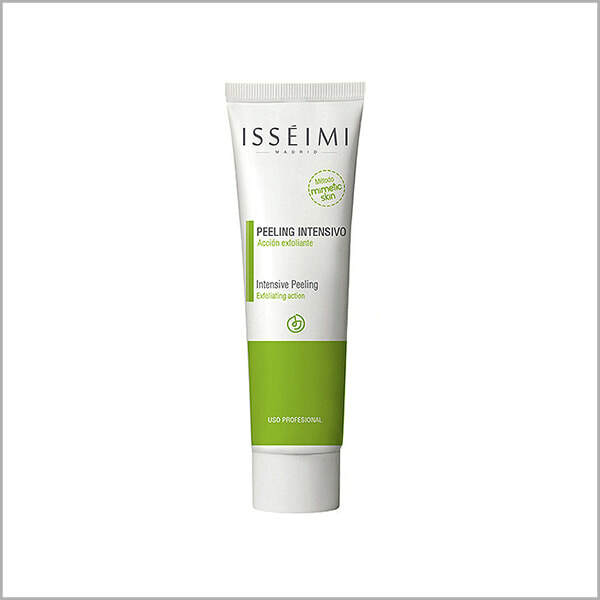 Ground rosehip and apricot kernels: enhance the chemical action of mechanical peeling when using MIMETIC SKIN's manual method by ISEEIMI. INSTRUCTIONS: Check application procedures. Pour enough amount of the product into a bowl to apply on face, neck and cleavage. Spread the peeling and use your hands to aid to the mechanical action by ground rosehip and apricot particles. Remove using a dry pad and calm the skin down with a gauze damped in Tónico Facial Equilibrante. Beauty and rejunevation come with Transdermal Therapeutic System (TTS). An innovative system with developed actives. 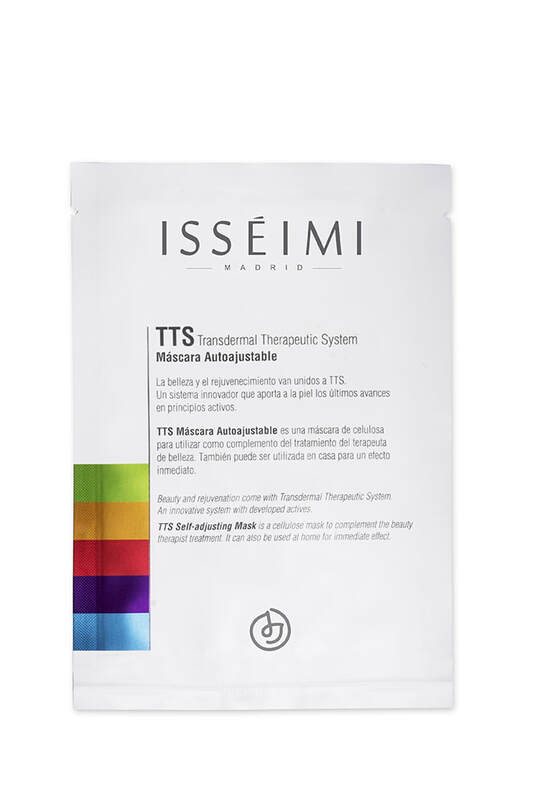 ​TTS Self-Adjusting Mask is a cellulose mask to complement the beauty therapist treatment. FORMAT: Single-use mask sachet (pack of 6 units). ACTION: It provides skin with relaxation, tone, vitality and luminosity. It ensures skin correct moisturising levels. It stimulates the cells by means of a regular provision of energising elements (ATP). Its high content in hyaluronic acid and ATP maintains skin moisturised and protected from external aggressions. MAIN INGREDIENTS: Hyaluronic Acid: It is a guardian of our organism's moisturising levels thanks to its large capacity to absorb and store water. It provides a filling effect on the deep depressions that characterise cutaneous wrinkles. It ensures optimum moisturising levels, particularly when treating mature skin. It stimulates peripheral circulation, revitalises cell cycle and favours the production of cell-produced substances such as collagen. ATP (Adenosine triphosphate): It provides skin with the necessary energy to support all of its biological functions, such as cell renovation, conservation of the immunologic system, the formation of the lipid barrier, cellular metabolism and enzymatic processes. Lavender extract: Light anti-oxidative, anti-microbial and anti-inflammatory actions. Aloe Vera: It has high moisturising and smoothing capacity and very important skin protective properties. BMB encapsulated ozonised oil: The extraordinary oxygenation achieved by ozone acts as a preventive agent when used regularly to prevent ageing. USES: Devitalised, discoloured skin. Provides luminosity, elasticity and energy to the dull and distressed skin. ​​INSTRUCTIONS: Match over the ATP Mask with Alabaster and press gently to blend them together. Other forms of use: See training courses. ACTION: Self-adjusting mask that oxygenates and revitalises skin while controlling excess of sebum. Moisturising and oxygenation of skin thanks to Aloe Vera and Ozonised Jojoba Oil that also purify and stimulate skin immunologic systems. MAIN INGREDIENTS: Lavender Hydrolate has the highest concentration and provides to the formula anti-microbial, anti-oxidative and slightly anti-inflammatory properties. Ozonised Jojoba Oil: It has been proven that ozonised oil is a real carrier of active oxygen. Such active oxygen stimulates skin endogenous defensive mechanisms and also prevents ageing and boosts cellular renovation of the skin. Ozone has relevant bactericide properties, which makes it appropriate for acne treatments. Aloe Vera: Moisturising. USES: It can be used on acne skin or skin with excess of sebum. Ozonised jojoba oil has got antiseptic properties that provide additional benefits to acne skin. Lavender Hydrolate also favours this anti-microbial and slightly anti-inflammatory action, so that it can be used after a peeling session; comedones removal, facial hygiene, laser. INSTRUCTIONS: After the selected treatment, apply the Máscara TTS and leave it on for at least 20 minutes. If the client is going to use it at home, it is recommended to do a thorough cleaning of the face with Emulsión Higienizante. It can be left on the skin until it is completely absorbed (between 30 and 50 minutes). ​OUR HINT: We also have other products for the treatment of acne skin, such as Kerathor 50 Plus and Emulsión Higienizante that can help to treat this disorder. 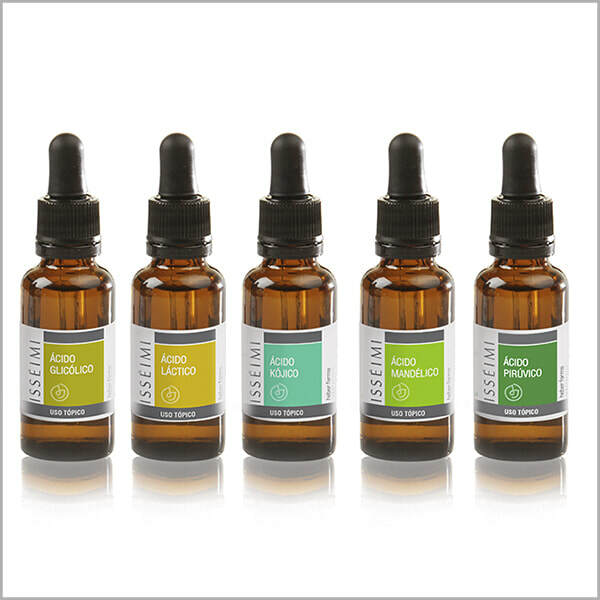 ACTION: Anti-ageing, regenerating and firming up effects. Remoulds facial contour. High content in specific and peptide active principles that act against ageing signs and fade away fines wrinkles as well as provide additional elasticity to obtain a shiny and renovated skin. MAIN INGREDIENTS: FGF (Fibroblast Growth Factor): FGF favours the proliferation of fibroblasts, which is essential for the normal functioning of the dermis. It also causes an increment in glycosaminoglycans, such as Hyaluronic Acid, which makes of it a great moisturising product that acts from the lowest skin layers. FGF requires a working procedure and a topical application that must be associated to other Growth Factor. Dmae: It is a natural nutrient that increases muscle tone and improves skin firmness and elasticity. It is a small molecule that penetrates skin easily. On the other hand, it increases water retention at skin surface, which provides a visible increment of tautness. 24-amino acid peptide known as EDP3, with lifting and firming up effects. When applied, the proliferation of keratinocytes increases. It acts at basal epidermic level on the keratinocytes membranes and at dermal level on the fibroblasts membranes. Chemitol tense: Amino acids (proline, serine, leucine, phenilalanyne, glutamic acid and aspartic acid) that present a high capacity to form saline links and/or hydrogen links, they favour UPHOLDING PROPERTIES (the facility to create links between protein hydrolysed substances and the skin) of the vegetable active principle and later on of its FILM-FORMING effect (it occurs when all the molecules that form the hydrolysed substance form a layer that totally covers the skin). This is a mechanism that reorganises its components' electric charges to allow a positive attraction with skin in order to obtain a long-lasting skin tension. Aloe Vera: Has high moisturising and smoothing capacity and very important skin protective properties. Elastin: Lipid deposits, UV radiation and enzymatic failures can alter desmosine syntheses and cause degenerating changes in elastic fibres. Calcium and fatty acids as well as cholesterol can attach to different points in elastin, which makes it more sensitive to enzymatic attacks by elastases and may deactivate it. It is recommended for ageing skin or for skin that lacks elasticity and firmness. DSH: Moisturising, anti-ageing and anti-free radicals. USES: Provides firmness to age sagging tissue. It is a method to treat neck and under-chin areas. ​INSTRUCTIONS: Match over the ATP Mask with Alabaster ​ and press gently to blend them together. ACTION: Self-adjusting mask to even up skin tone. Its cocktail of active principles, peptides and specific extracts acts at different levels to fight against dark spots and stop ageing processes caused by free radicals. MAIN INGREDIENTS: Cocktail of depigmenting active ingredients: Fraction obtained from fermentation (kojic and lactic acid), from liquorice and TRANSCUTOL® extracts. - Kojic acid: Inhibits tirosinase action and reduces melanin synthesis. - TRANSCUTOL: Promotes transdermal absorption, improves permeability of membranes and acts as a reservoir by forming a kind of epidermal deposit. - Lactic acid: Enhances surface cell renovation and contributes to the degradation of melanin from superficial layers. - Liquorice: It is beneficial for the acids without any irritation. Oligopeptide-50: Also known as Glamerin, it is a depigmenting substance that prevents the generation of melanin and delays the appearance of dark spots. It reduces melanin contents in melanocytes. Wheat germ: Enriches the formula with tocopherols, fat acids and vitamin E. Its anti-ageing and anti-oxidative properties inhibit free radicals and prevent oxidative processes at cell tissue level. USES: Apply at night. When there are local dark spots, previously apply Claridermil Aclarante. The depigmenting effect of peptides corrects and delays the appearance of dark spots. FORMAT: Single-use mask sachet (pack of 6 units). Self-adjusting mask that boosts and revitalises skin and prolongs cellular activity making it look younger. ACTION: Increases skin vitality and provides an improved texture. Increases vitality and longevity of epithelial stem cells and acts against chronological ageing. Stem cells contribute to prolong skin cells activity and, thanks to their composition, rich in vitamins and fatty acids, favours cell regeneration. MALUS DOMESTICA: Vegetable stem cells. Stem cells repair damaged tissues by means of a replication that occurs at the basal layer of the skin. If there is no injury, it is recommended to apply in order to maintain a healthy skin condition and to restore its smoothness as well as to keep a good self-renovating rate. STEM CELLS FROM MALUS DOMESTICA come from a Swiss apple variety whose epithelial generating properties were studied because of its longevity. Once they have been extracted from the stem cells, they are transported by nanosomes to facilitate their penetration through dermal layers. It has been observed that, STEM CELLS FROM MALUS DOMESTICA prolong the life of own skin stem cells and, therefore, provide them with a longer regenerating capacity. In this manner skin cell balance is restored and maintained to obtain anti-ageing and preventive effects. Vitamin complex: A mixture of extracts and vitamins as follows: - Indian chestnut: Acts as a vessel tonic barrier that exhibits noticeable vessel, exudative and anti-edematose properties. Has astringent attributes with a beneficial effect on fatty skin. It is also used against couperosis disorders. - Fucus: cleansing effect that contributes to keep skin free from grease. - Provit-II, liposoluble and water-soluble vitamins have been blended in a water-soluble form together with omega-3 and omega-6 rich vegetable oil. Vitamin A favours the renovation of cells and prevents excess of keratin production. Vitamin E is used for its regenerating properties on skin and hair due to its action which improves blood circulation. 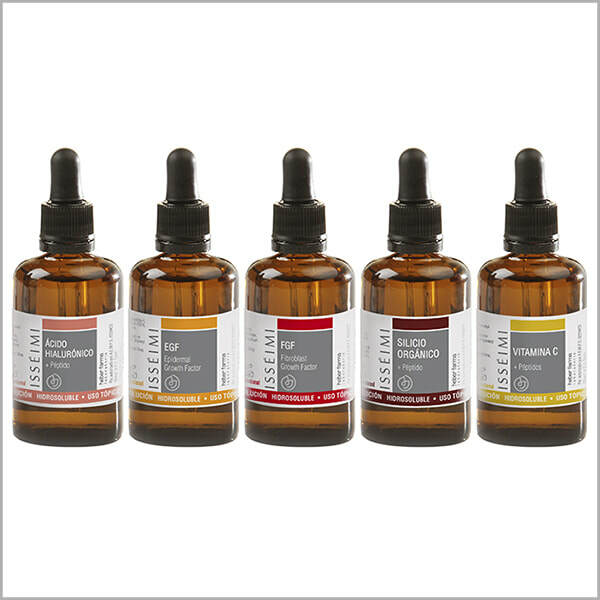 Group B vitamins are used in treatments against skin and scalp seborrhea and other skin inflammatory disorders. Omega-3 and Omega-6 fat acids restore the integrity of membranes and skin protective-barrier function. Aloe Vera: Presents high moisturising and smoothing capacity and very important skin protective properties. Ozone in bio-membranes: Ozone is a great natural bactericide and fungicide product. The extraordinary oxygenation achieved by ozone make it act as a preventive agent when used regularly. Vitamin C: Provides an essential anti-free radical effect that prevents ageing and provides the necessary nutrients for the correct functioning of cells. Vitamin E: Anti-oxidative properties. USES: Against the first signs of ageing, lack of vitality or luminosity. INSTRUCTIONS: Match over the Mascarilla ATP + Alabastro and press gently to blend them together. -These masks are exclusively for external use. -Do not apply directly on the eyes. If any irritation is observed, remove the mask and rinse with plenty of water. ​ -Once the sachet has been opened, it must be applied immediately. 2. Open the sachet and take out the mask. Spread the mask over the face. 3. Adjust totally on the skin and position the openings over eyes, mouth and ears. 4. Press lightly with both hands until it is totally adhered to the face. 5. Use the flaps over both ears to hold the mask in place. ​6. Remove after 30 minutes and massage gently until all the rests have been completely absorbed. Do not rinse. 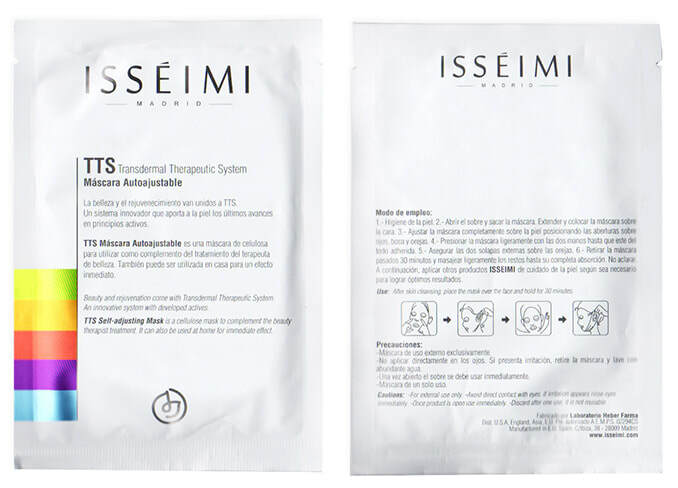 ​Then, apply other ISSEIMI skin care products to obtain optimum results. ACTION: Paste mask that contains a combination of energising active principles which contribute to revitalise, tone up, moisturise and reactivate skin luminosity. 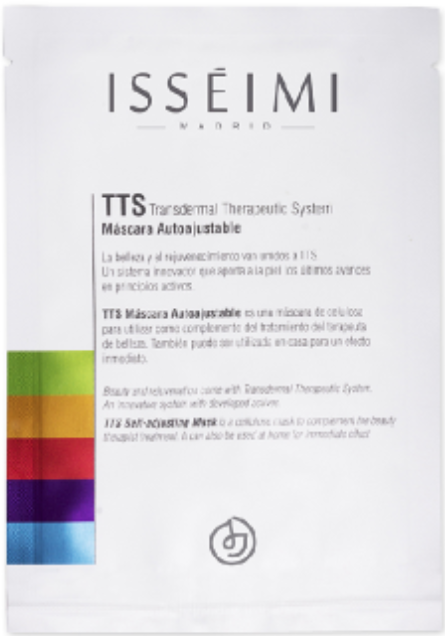 For a better result, a Máscara TTS or Dermocompresa should be applied on the mask. MAIN INGREDIENTS: Energising active principle: restores tone, softens relief imperfections and increases moisturising status; which results in a healthier looking skin. ATP: Adenosine triphosphate. This substance is involved in reservoirs and release of energy. It is used as an source of nucleotide. Allantoin: A substance with re-epithelial properties. Urea (carbamide): It is part of the natural moisturising factor in skin. Its high moisturising action is due to its capacity to catch and retain water on skin surface. Minerals: Astringent and absorption properties on the impurities retained into skin pores. It makes skin softer and midly activates blood microcirculation. USES: It is to be applied always after Mimetic Skin treatment, as part of the skin repairing process in Mimetic Skin protocols. It should be used in treatments for skin hygiene, after microdermabrasion or in treatments where quick results are desired. INSTRUCTIONS: Professional use. Using a spatula or a brush, apply enough amount of product on the face to create a uniform layer. Do not remove for 10-15 minutes to let the skin absorb all the product. When most of the product has been absorbed, massage if necessary to complete the absorption of the product. HINT: Adjust a TTS Mask on the Mascarilla ATP and massage with a pumping or relaxing movement. It will provide great comfort to users. AVOID CONTACT WITH EYES. Stretch marks appear as thin, shiny, reddish parallel lines which turn whitish over time, gaining the appearance of scars. They can be observed when there is rapid stretching of the skin for many reasons (growth, weight gain or certain diseases). They can also be the result of anomalous collagen formation or a consequence of medicines or chemical substances which interfere with its formation. Stretch marks are most often found on the breasts, hips, thighs, buttocks, abdomen, and sides. AQUA O3 REPAIR contains active agents working in synergy to promote the formation of fundamental substances such as collagen, elastin and hyaluronic acid, improving the appearance of stretch marks and giving the skin greater elasticity. Indicated to improve the appearance of red and white stretch marks, acne scars. ​Ageing is characterized by degradation of fibroblast proliferation and reduction of collagen, elastin and glycosaminoglycan synthesis. These substances constitute the supporting base of the skin, providing it with elasticity and firmness. 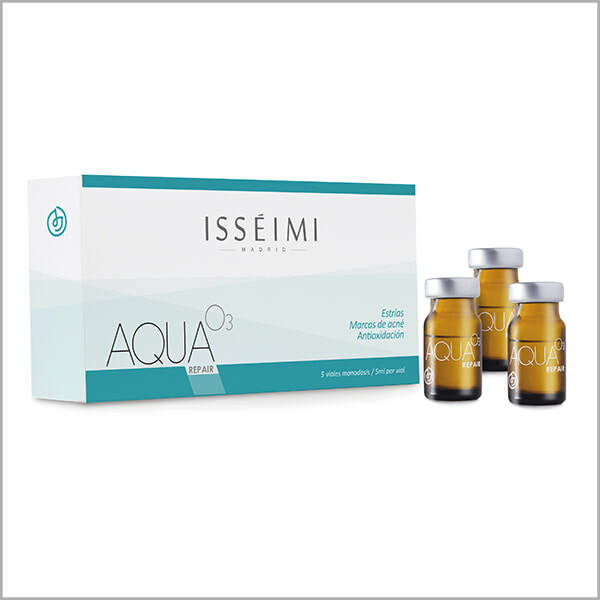 AQUA O3 FIRMING contains the essential active agents to stimulate the fibroblasts, regenerate the elastic fibers and achieve cell renewal. Indicated for skin which presents signs of sagging. Use on the oval of the face, neck, and inside of the arms. ​Over time, the skin starts to lose the fundamental substances of which it is made. The collagen loses solubility and skin tone and elasticity reduce. At the same time, fibroblast metabolism slows, the epidermis flattens and wrinkles appear. Expression lines also appear as a result of lack of hydration. Thanks to its cocktail of anti-aging active agents (growth factors, peptides, vitamins and amino acids), AQUA O3 ANTIAGING (GF) acts to regenerate the tissues and revitalize your skin. Its high content of low molecular weight Hyaluronic Acid also provides extra hydration, improving dry skin and skin without shine. Indicated for persons presenting chrono-aging or photoageing. Skin with lack of brightness. Improvement of fine wrinkles and expression lines. Melanin is a natural, ochre-colored substance created by melanocytes in our skin. It protects us from solar radiation. When our skin generates too much melanin, it is deposited in the different layers of keratinocytes, forming a dark spot. Thanks to the action of its depigmenting active agents and the antioxidant power of ozone, AQUA O3 WHITENING acts at different levels to combat dark spots on the skin by regulating melanin synthesis and putting a break on the aging caused by free radicals. Indicated for skin presenting hyperpigmented zones such as sunspots and hormonal spots. Epidermal Growth Factor is a cytokine that allows vehiculisation in a multi-lamellar liposome to ensure perfect dosing to every skin layer. This technology, PATENTED by Heber Farma, is the only one that ensures the absorption of the active principle down to the deepest skin layers. MAIN INGREDIENTS: The main ingredient of Senitul is Epidermal Growth Factor (EGF), a protein that favours regeneration thanks to a number of reactions at dermis and epidermis levels. EGF relaunches the regeneration process in damaged skin since it promotes anti-oxidative effects by stimulating the SOD system. It favours the proliferation of fibroblasts and keratinocytes, as well as an increase production of collagen and elastin, which are essential substances for the regeneration of tissue. Senitul, therefore, accelerates epidermal renovation and ensures a quick regeneration with better quality skin thanks to the enhancement of the production of extracellular matrix substances. ACTION: The EGF increases the mitotic activity of epidermal cells. Stimulates the synthesis of collagen. Stimulates the multiplication of the fibroblasts. The EGF is an authentic regulator of skin functions. MAIN INGREDIENTS: EGF: The Epidermal Growth Factor Factor binds to its receptor and results a response in skin cells, consisting in the proliferation of keratinocyte and fibroblast proliferation, increased collagen synthesis (essential in healing), and activation of the anti-stress and SOD activity (antioxidant and anti-aging effect). INDICATIONS: Concentration of EGF for the regeneration of the skin especially in the most damaged areas of the face. Recommended in injured skin, after surgery, after laser therapy, keloids, scars, child surgery ... It serves as a complement to other skin products with acne.